These are obviously not Native Americans. They’re white Americans who decline to indicate any European ancestral country of origin. It seems the highest concentration of these “unhyphenated Americans” is right here in Kentucky. Now consider the following map of results from the 2008 presidential election to the 2004 presidential election (data from The New York Times). The blue counties are those where Obama did better in 2008 than Kerry did in 2004 (just about everywhere). 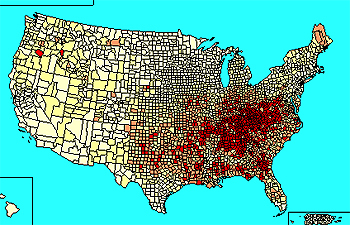 The red counties are those where Obama did worse. 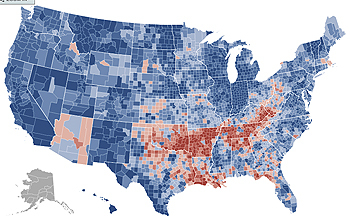 The next two maps show the 2008 Democratic primary results: Obama vs. Clinton. 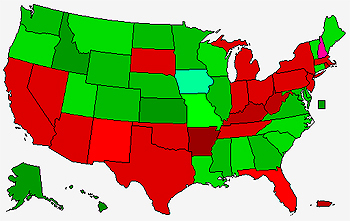 In the first, Obama won the green counties and Clinton won the blue states. These show that Obama performed dismally in states like Arkansas, Tennessee, Kentucky, and West Virginia, even among Democratic primary voters. I noticed this general pattern shortly after the 2008 presidential election, but I was at a loss to explain why areas where people identify as “unhyphenated Americans” would seem to have very low opinions of President Obama. It can’t just be a partisan thing, because Obama did better than Kerry in some very, very conservative Republican states in the Rocky Mountain West. This week a paper was published in Social Science Quarterly entitled “Barack Obama’s ‘American’ Problem: Unhyphenated Americans in the 2008 Elections“. The authors (Brian Arbour and Jeremy Teigen) are interested in this same question: what’s the connection between unhyphenated Americans and the lack of support for President Obama? They show statistical evidence that counties with higher levels of unhyphenated Americans were indeed less likely to vote for President Obama, even controlling for partisanship, religious context, racial context, and other sociodemographic factors. They explain: “[These are] Americans who have abandoned or lost consciousness of their European heritage” (2). Why is this the case? The authors offer a few explanations: 1) perhaps its for patriotic reasons, 2) perhaps lower educational levels mean that people are simply unaware of their ancestral countries of origin, and 3) perhaps it’s because sufficient generations have passed that these Americans are simply forgetting their ancestral European heritage or no longer care about it. This region of Obama’s weakness follows the line of pre-Civil-War western migration of highland southerners, the farmers of the hardscrabble southern hills who never had enough money to buy land in the fertile Deep South and who moved from the Appalachian highlands across the upperSouth and into the near Southwest (Key, 1949). Historians and pundits have long associated this region and pattern of migration with the Scots-Irish (Fischer, 1989; Webb, 2004; Joseph, 2009). These are regions of the highland South where rocky and hilly terrain made plantation farming difficult and, as a result, African-American populations have always been smaller than in the Deep South. This region also corresponds to the areas where unhyphenated Americans are most highly concentrated. Unhyphenated Americans are concentrated in the South, the one major region of the country where Obama has never lived. Obama appears worldly, sophisticated, and urbane, whereas the aggregate data about unhyphenated Americans suggest that these adjectives would not apply to [most of them]. In addition to these mutable characteristics, two immutable characteristics of Barack Obama may lead unhyphenated Americans to see themselves as distant from him. One is his foreign roots, as epitomized by his name. Obama’s father was Kenyan, and Obama’s immediate connection to immigrant roots and a foreign country contrasts strongly with those who believe their ancestors come from America. Second is Obama’s race. As noted, unhyphenated Americans come from regions and demographic groups who are not well known for their progressive views on civil rights or their acceptance of integration and diversity. To me, this sheds considerable light on the “puzzle” described at the outset and I commend the authors for their interesting and insightful analysis. This entry was posted in Kentucky politics, Political Science, U.S. politics. Bookmark the permalink.